This article contains different methods that you can use to recharge your GOtv from the comfort of your house or office. Normally you will be expected to visit any GOtv branch or outlet near your area,but that is about to change because am going to show you other effective ways to pay for your GOtv subscription. Make sure your decoder is switched on. You have the option to pay for your Gotv account or Someones account. Enter your Surname or mobile number in the first field povided. Fill in all details and make payment. Select the GOtv bouquet of your choice (GOtv or GOtvplus). Confirm that your IUC number was filled correctly. Enter your card details -Card Number,Expiry Date and 4 digit PIN. If the transaction was successful your viewing will be restored. With eTranzact BankIT you can pay for your GOtv subscription through your bank account, online and through your mobile phone. Dial *389*9*smartcardnumber# from any phone. Dial *389*00# with phone number registered with the nominated Bank to receive an OTP. A Payment Response stating the details of the transaction is then received, indicating successful payment. A GOtv customer can make the payments through a registered mobile wallet using a mobile phone, laptop or desktop device. Simply log in (www.mypaga.com), fill out the info transparent, then click “go”. Immediately payment is made your viewing would be restored within a short while. 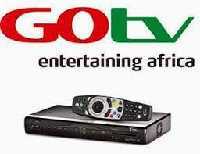 GOtv Allows you to make GOtv payment using your Eazy Money mobile wallet online i.e (eazy.gotvafrica.com/pay). To make payment simply, enter your mobile number and Eazy money PIN. Should you not have a Eazy money wallet, you can register at any Zenith Bank branch. To make an online payment for your GOtv subscription using via GlobalPAY, simply visit eazy.gotvafrica.com/pay and hen log into your account. You can make payment or subscription for your GOtv via The Stanbic Mobile Wallet. The Stanbic Mobile Wallet is USSD-based. The customer is required to dial a short code and the menu will be displayed on the screen. Provide customer information required on each field and send. Select Mobile Money, input your number. It will then direct customer to GOtv Page on Stanbic Mobile. Cash is received by FCMB tellers at all FCMB Branches. Fill a form by the teller by inputting your name, phone number and IUC number. You can use Zenith Bank's mobile wallet from Zenith Bank, Nigeria to make payment for your subscription. You can download the application from the mobile app store or from www.eazymoney.com.ng. After Logging in, the customer must select Bill payment. The Biller Number is the smartcard number. Customer must enter the amount intending to pay. The App on the phone can be used by multiple users. (This service is for Zenith Account holders who has linked their account to the mobile wallet known as the Banked Customers while Eazy money selection is for Non-Zenith Account Holders called Unbanked Customers). The Biller Code is DStv. In other to make payments for your GOtv subscription using KongaPay, visit konkgapay.com or download the app ( available for Android and iOS devices) and then register or log in to your account. Go to services and bills and select TV subscription, select GOtv as the subscription type and input your smart card number. Select *Auto-renew every month* to authorize GOtv to automatically bill and renew your subscription every month if that is your preference. If successful, you will get a message "Retrieving your balance"
To pay for your bills, simply dial *945#, select Pay Bills, choose the desired option, respond to the options and make your payment.